Anyone with even a passing interest in Architecture will know the name Frank Lloyd Wright. During his 70 year creative period, 532 of Wright’s designs were built and his Fallingwater project has become one of the best known and most recognizable examples of American architecture. Less well known are Wright’s unbuilt projects. An enormous number, over 600 in fact, were never realized, but now, thanks to the visualization skills of Spanish Architect David Romero, we can get a vivid sense of how these buildings might have looked. David Romero’s project Hooked on the Past, focuses on the re-creation of the unbuilt architecture of yesterday, a fascinating field of work that is often overlooked in the world of architectural visualization. The Hooked on the Past project has so far focused on the work of Frank Lloyd Wright and two recent projects serve as great examples of David’s typical workflow. One of the reasons RailClone can help artists like David is its ability to make large sophisticated procedural objects from relatively simple and easy to model repeated elements. The Ramp in the Gordon Strong building is a good example. The whole object is created from the 3 modular pieces shown below. These are much easier and faster to model that then the entire building, and it only takes a little forward planning and understanding of RailClone’s approach to modelling to save a lot of time. You might wonder how these 3 simple pieces become a whole façade? It’s actually very simple. RailClone is able to repeat and distribute geometry along splines, and deform it to follow the curvature of the path. By arraying the pieces along the helicoidal spline shown below it was possible to make the whole ramp section from just a few pieces. Best of all, because RailClone is a procedural object, it’s easy to edit. By tweaking or substituting the original 3 segments, the whole building can be quickly iterated. The final geometry for the building’s shell is shown below in the viewport and a render. RailClone has many uses, not limited to creating a single contiguous mesh. It’s equally well suited to advanced spline-based placement of single objects, like furniture inside buildings. In this project, David used RailClone to place all the tables and chairs inside the planetarium. Forest Pack, as the name suggests, is most commonly associated with scattering plants, rocks and trees to create rich renders of natural environments. When rendering the landscape that surrounds an architectural project, “where is it located ?” is the first obvious question. 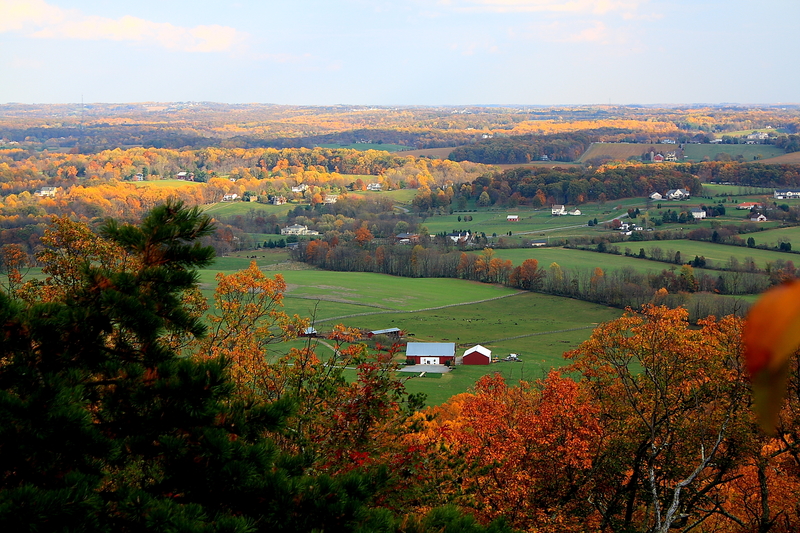 The original site for the Gordon Strong Automobile Objective was in a beautiful natural landscape in Maryland. To get the fall look, Forest Colour was used to randomise between yellow and browning leaves on all the trees. If you’d like to learn more about that technique there’s a useful tutorial called Autumn Park. How many trees? Not as many as you’d think. By randomizing the translation, rotation and scale of plant models it is possible to disguise the fact that you are using just a few variations with no obvious visible repetition. In fact, there are only 3 trees used in the entire scene and just a handful of smaller plants, bushes rocks, and other ground cover as shown in the image below. Using several Forest Pack objects to scatter these objects in successive layers on the terrain, David was able to create all the vegetation for the scene in a way that would render efficiently and was easy to update. If you’d like to know more about this project, there is an extensive article in the magazine that covers the process of creating the images in more detail. The second Project created with the help of Forest Pack and RailClone is Frank Lloyd Wright’s E.A. Smith House. The cabin was planned to be built in the beautiful Piedmont Pines, Oakland. “These images have been made using my usual workflow,” David tells us, “Modeling in Autocad, lighting, cameras and vegetation in 3DS Max, Rendering with V-Ray and finishing touches in Photoshop. More recently David collaborated with Unreal Enterprise and HP to convert an old scene of Frank Lloyd Wright’s Trinity Chapel to virtual reality. Using the Datasmith tool that comes as part of Unreal Studio and supports Forest Pack and RailClone, David was able to convert his scene to an interactive VR experience that included audio, voiceover, different lighting possibilities and pop up information points to explain more about the design. If you want to try the VR experience for yourself, it can be downloaded from the Unreal website or you watch the following video to see a prerecorded demo. If you’re interested in being showcased in an article or you’d like to share images in our gallery, please feel free to email submission@itoosoft.com.